4th Sunday of Lent (C). Laetare Sunday. Dear friends, today, the 4th Sunday of Lent, we celebrate the Laetare (Rejoice) Sunday . The Lenten season reaches its climax in the Passion, and hence in suffering, and we realize that approaching the Cross also means that the moment of our Redemption is coming ever closer. In this way, the entire Church and each of her children are filled with joy as we pray in the Entrance Antiphon of the Holy Mass. Today’s Sunday liturgy is a joyful and hopeful proclamation of the Paschal mystery (=Passion, Death and Resurrection) of Our Lord Jesus Christ through which He gained us our salvation. In the history of salvation, “PASCH” signifies for the entire Church and for each one of us, the urgency of a NEW LIFE, the responsibility of NEW CREATURES who are reconciled with the Father through the saving sacrifice of His Son. The intense interior and exterior purification which we carry out during the Lenten season prepares us to receive this new life of Christ and commemorate it as well. It is necessary to seriously intensify the process of our personal conversion for the liturgical celebration of Paschal mystery requires it. The joy-filled ambience in the Church for the forthcoming commemoration of our Redemption during Holy Week is manifested by this Sunday’s readings. In the 1st reading (Joshua 5:9-12), the people of God celebrate the Passover (Pasch) before entering the Promised land. After 40 years of pilgrimage, the people of Israel entered into the land of salvation. It is there where the PASCH WAS CELEBRATED FOR THE 1ST TIME AS THE INAUGURATION OF A NEW AND FREE LIFE. In the 2nd reading (2 Cor 5:17-21), St. Paul reminds us the God has reconciled us to Himself through Our Lord Jesus Christ, the definitive New Man, who through his death has opened way to a NEW CREATION AND NEW LIFE. This fact, however, demands from each of us a NEW LIFE, THAT OF HOLINESS, LIVING CHRIST’S LIFE: giving death unto sin and to the old man within us in order to RECONCILE WITH GOD and AUTHENTICALLY LIVE AS HIS CHILDREN. 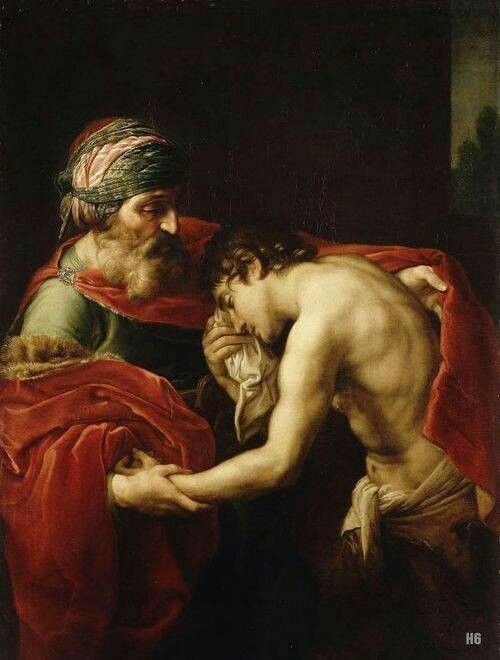 The above-mentioned ideas are reinforced anew in the Gospel which recounts the wonderful Parable of the Prodigal Son (Lk 15: 1-3.11-32) which describes not only OUR JOY WHEN WE RECONCILE OURSELVES WITH GOD BUT GOD’S JOY UPON RECEIVING AND FORGIVING HIS LOST SON WHO HAS FINALLY RETURNED TO HIS FATHER’S HOUSE. After the degradation of our life due to sin, only through penance and returning to God through humility, contrition and the Sacrament of Confession could guarantee our true sanctifying reconciliation with the Father. Such is God’s joy as well –or perhaps, much more– when we return to his house and ask him for forgiveness! Dear friends, let us take heed of God’s continuous call for our conversion, for our return to his arms, with the purpose of amendment to change the course of our life for the better and not to leave his house but remain with Him, living a new life, the life of Christ, once and for always. Only then shall we experience the joy of reconciling with God and make God as well happy upon seeing us return to Him. This, however, does not signify that we will be infallible. No. We will be sinners till the end. But with the God’s help, and if there is struggle out of love for Him, if there is humility to acknowledge our sins and begin again, then spiritual progress and intimacy with God are possible and, with God’s grace and our correspondence, in time, our falls will be in matters of less gravity. The important thing, as Pope Francis often repeated, is never to tire in asking God for forgiveness, in beginning all over again, in standing up everytime we fall, to seek His Mercy. It is the daily struggle done out of humility and love which counts in God’s eyes and in the end, “He who perseveres, will be saved” as Our Lord told us. O God, who through your Word reconciles in a wonderful way the human race to yourself, grant that the Christian people, we pray, may hasten with prompt devotion and eager faith toward the solemn celebrations to come. SEE AS WELL: 4TH SUNDAY OF LENT (C) MASS PRAYERS AND READINGS. Cordially inviting you to visit and like our FB page in www.fb.com/CatholicsstrivingforHoliness or sign-up to our website, www.catholicsstrivingforholiness.org, so we can have a wider apostolic reach and thus help more people in their Christian life. 1st Saturday Devotion to the Immaculate Heart of Mary. WE NEED TO PRAY HARD FOR THE PEACE AND SAFETY OF THE PHILIPPINES AND OF THE WHOLE WORLD.